1933 begins with Lugosi in bankruptcy, newly-wed (in January to Lillian Arch) and work becoming scarce. Horror films are slipping into eclipse due to the first wave of censorship outcries, and Lugosi learns the impact of his stereotyping on his career. His interviews for 1933 are all from the early part of the year, in Hollywood. By year’s end, he retreats to Broadway and then to vaudeville. I talked to him. This man who dares not sleep at night. This strange being who dreads the darkness that is people with supernatural beings…evil talons, poised to strike…grinning mouths…dripping with the blood of their victims. Quaking inwardly, I stood before the entrance of Bela Lugosi’s imposing castle in the mountains, waiting timorously, to be admitted. No sound came from within. The eerie stillness was stifling. Unseen hands seemed to clutch at my throat. Distantly, a hound bayed. I wanted to run away. But the wide oaken door was opening…slowly…soundlessly. Desperately, I tried to turn and flee from the evil spot. But my feet were rooted to the ground…. And now, kiddies, if you’re sufficiently cooled off, permit the ducky bumps to go into retirement, comb down your top hair, and meet the most misunderstood, misrepresented man in all Hollywood! Ever since Dracula, Bela Lugosi has been pictured as a veritable fiend in human form, a being—half man, half vampire—who cavorts with evil spirits and nips sleeping females directly south of the Adam’s apple, by night; and scampers (or flits) to his underground tomb, by day. In the first place, any neck-nipping vampire would have a tough time finding a Hollywood female who sleeps nights. And it would be even a tougher job for him to locate a tomb in which to lay his weary head. Because all the underground “tombs” these days are naively termed “speakeasies” and happen to be closed during those hours when self-respecting vampires are supposed to be sleeping it off. So there! Consequently, every time he opened his mouth I automatically reached for my hat—until the whole thing took on the aspect of a first-class shambles! We sat in one corner of the spacious living room and eyed each other suspiciously. An innocent bystander would have concluded that we were playing a game, wherein the first one who said a word had to wash the dishes! I was just beginning to be sorry I’d come when my unresponsive host called to another part of the house by a respectfully insistent voice, and, excusing himself briefly, he strode out, leaving me to my own devises. He’s gone quite awhile. But, as he hadn’t taken any luggage, I knew he’d probably be back sometime. So I waited. After about 10 minutes of plain and fancy thumb-twiddling I began to look around for some other method of amusing myself. As the last note died away, I turned to face my host, who had silently returned. The change in him was almost unbelievable. His face had softened and the pale eyes were bright and suspiciously wet. The music of his homeland had turned the trick. From that moment we were friends. Bela Lugosi is extremely sentimental about the land of his birth. In his own element, at the Hungarian Club, I have seen tears on his cheeks, heard him sob like a child, at the haunting, bittersweet melodies of his native land, played with all the primitive fierceness of the Magyars, by the gypsy orchestra. Temperamental—and with the keen sensitiveness of the true artist—he seems pathetically out of place in the mad whirligig of light and color that is Hollywood. His natural reticence mistaken for unsociability, Lugosi is a lone wolf. And his very loneliness lends him an air of sinister mystery, upon which the ladies and gentlemen of the press have pounced with diabolic glee. If you could know the real Lugosi—if you could see him as he romps with his beloved dogs; listen to him as he speaks, reverently, of the land that fostered him—you would be amazed at the gentle philosophy of the genius who created fiendish Dracula. More than anything else, he deplores the fates that have destined him to eternal fiendishness. Bela Lugosi is one of the real actors in the profession. Innocently enough I made the horrible mistake of questioning his original intentions. He drew himself up. “I am an actor!” he said stiffly. Which isn’t a bad idea at all. Although a few of our American contemporaries who served their apprenticeship behind the wheel of a truck, or on the business end of a shovel, are doing nicely thank you. Lugosi’s love affairs have been many and varied—characterizing the emotional intensity so typical of the true Continental. But he prefers not to speak of them. So—you nosey little mugs—if you would know the “lowdown” on his hectic romance with the Brooklyn Bonfire, or the truth about his two unfortunate marriages—you’ll have to content yourselves with reading up the back numbers of the good old tabloids. While refusing to discuss his romantic adventures, Lugosi makes no secret of his love for his dogs. And it is a beautiful thing to behold. For they return his affection with a worshipful adoration, a faithful devotion, that the lonely man had not found in human relationship. When he is talking they lie quietly at his feet, following his every gesture with approving eyes. But let him rise and move across the room, and they are on him like a flash, leaping at him, barking joyously, begging, dog fashion, for a romp. Dracula, a beautiful Doberman—whose evil eyes and strikingly sinister appearance are strongly suggestive of the fantastic being for which it is named—is his favorite. She had recently starred in a canine Blessed Event, and Lugosi led me down to the kennel to inspect the pedigreed progeny. Perfectly marked, the eight puppies were identical, miniature carbon copies of their sleek, graceful mother. Lugosi’s approach was the signal for a mass attack. Yelping joyously, they surrounded him, tails wagging furiously…all eight of ’em! Laughing happily, the Master Fiend went down on his knees, arms outstretched to encircle them all. And they mussed his hair, tugged at his tie, left multiple dusty smudges on his immaculate white flannels, while they yelped madly in concert. I watched the scene in amazement. And, as I watched, Lugosi raised a strangely transfigured face to mine. “My family!” he cried joyously. An unexplainable emotion gripped me. Where was the fiend, in human form?…the diabolical Dracula?…Surely, not here…not this happy man who murmured gentle endearments to a flock of mauling puppies. I left him there. It was a beautiful picture to carry away with me. Mysterious? Sinister? Don’t you believe it! The evil shadows had fallen away, and I had seen the real Lugosi. Genial, sincere, and—sadly enough—misunderstood…and lonely. Transcriber’s Note: The below is an extract syndicated news column that appeared in many newspapers on or about April 23, 1933. Bela Lugosi was an actor of parts before he became “Dracula,” but he has been the “vampire” ever since, and most of his screen roles have been only variations of his first major hit in pictures. 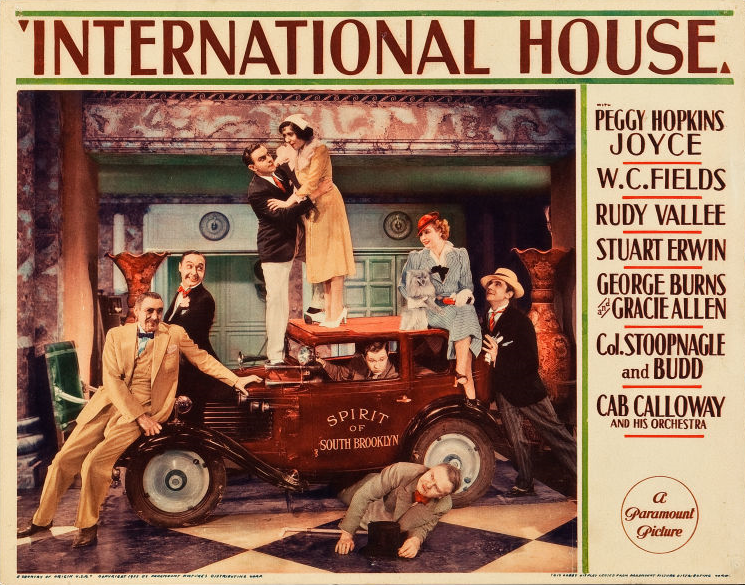 But for International House he has been cast in a strictly comedy part, as one of Peggy Hopkins Joyce’s several ex-husbands. It’s character comedy, and not slapstick, but for once he doesn’t stalk around, frighten women and children, and make himself generally a terror. “Eddie Sutherland, the director, seems to be the first to have considered me an actor, instead of just Dracula,” Lugosi remarks with a smile. Lugosi is content to leave horror roles to other players who may want them, and hopes this departure is the beginning of a new career for him in which he can qualify (in studio eyes as well as his own) for variety in roles. In Hungary, where he was born, he points out, acting is a profession for which one is trained, and acting is his profession. Acting confined within the limits of one type or role, he pleads, is no acting at all, and it is not for him. Despite his horror assignments, Lugosi admits no interest whatever in spooks, magic or the occult. “Funny thing,” he recalls, “I used to be intrigued by such things, but after 1,000 performances of Dracula, I lost interest. It was too much. Transcriber’s Note: The article below is from the Press Book for the 1933 release of Night of Terror. It would have used in newspapers in towns playing the movie. As with all press books, the quotes attributed to Lugosi may be fabricated. Those cinema fans who have experienced numerous shocks from the sinister characterizations of Bela Lugosi, of Dracula fame, can hardly be prepared for the astonishing announcement that the famous master of “monster” roles would like to portray sympathetic down-east characters instead of the nerve-tingling horror-loving persons that have been his dramatic specialty. 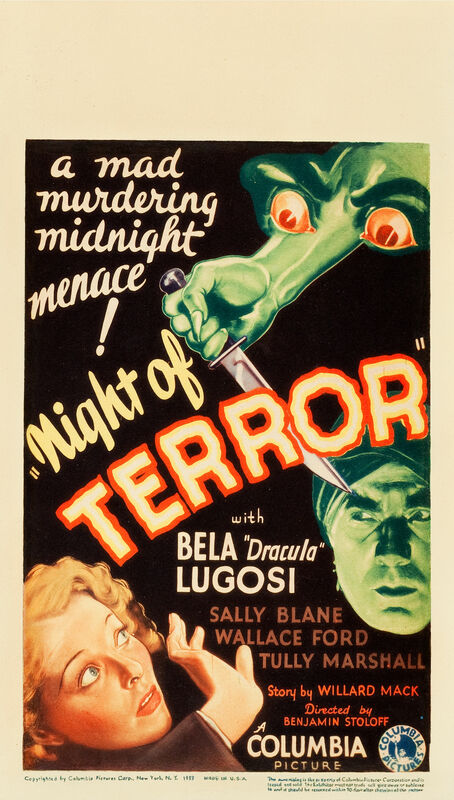 Audiences naturally attach the name of Lugosi to slinking figures, death notes, mysterious murders, yawning trap-doors, hands that reach out from hidden panels to seize the heroine, and menacing eyes. And in much the same manner, Hollywood has scribbled a little card of classification that had limited the screen roles of Bela Lugosi since his international success in the title role of Dracula. It was this characterization that offered Lugosi his first opportunity in Hollywood, and started the chain of “horror” roles he has consistently enacted since that time. The 13th Chair, Murders in the Rue Morgue, The Black Camel, Chandu the Magician and The Death Kiss are a few in which Bela sent chills out over the talking screen and successfully established himself as a star, although one whose screen reputation was cloaked with sinister mystery. Away from the studio is easy to comprehend Lugosi’s ambition. His eyes are as piercing as they are on the screen, but his quiet manner reflects his aristocratic Hungarian family. He is urbane, intellectual and prone to drop little witticisms that suddenly bounce back with a humorous sting when you are not expecting them. In addition to his longing for a trend toward almost “Pollyanna” roles, Lugosi is frank to admit that his other ambition is to retire from the screen and settle down in peace and solitude on a little farm far from Dracula and other cinema monsters. His non-professional wife shares this desire, and so you may well contemplate the unusual picture of an arch-fiend someday digging potatoes, reading The Country Gentlemen, and whittling in front of the town post office.